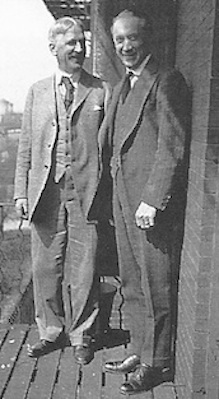 John Dewey (left) and F. M. Alexander. The principle and procedure set forth by Mr. Alexander are crucially needed at present. Strangely, this is the very reason why they are hard to understand and accept. For although there is nothing esoteric in his teaching, and although his exposition is made in the simplest English, free from technical words, it is difficult to grasp its full force without having actual demonstration of the principle in operation. And even then, as I know from personal experience, its full meaning dawns upon one only slowly and with new meanings continually opening up. Since I can add nothing to the clear and full exposition that Mr. Alexander has himself given, it has occurred to me that the most useful form this introductory word can take is an attempt to explain wherein lies the difficulty in grasping his principle. The chief difficulty, as I have said, lies in the fact that it is so badly needed. The seeming contradiction in this statement is just one instance of the vicious circle which is frequently pointed out and fully dealt with in the pages of the text. The principle is badly needed, because in all matters that concern the individual self and the conduct of its life there is a defective and lowered sensory appreciation and judgment, both of ourselves and of our acts, which accompanies our wrongly-adjusted psycho-physical mechanisms. It is precisely this perverted consciousness which we bring with us to the reading and comprehension of Mr. Alexander's pages, and which makes it hard for us to realize his statements as to its existence, causes, and effects. We have become so used to it that we take it for granted. It forms, as he has so clearly shown, our standard of rightness. It influences our every observation, interpretation, and judgment. It is the one factor which enters into our every act and thought. Consequently, only when the results of Mr. Alexander's lessons have changed one's sensory appreciation and supplied a new standard, so that the old and new conditon can be compared with each other, does the concrete force of his teaching come home to one. In spite of the whole tenor of Mr. Alexander's teaching, it is this which makes it practically impossible for anyone to go to him with any other idea at the outset beyond that of gaining some specific relief and remedy. Even after a considerable degree of experience with his lessons, it is quite possible for one to prize his method merely on account of specific benefits received, even though one recognizes that these benefits include a changed emotional condition and a different outlook on life. Only when a pupil reaches the point of giving his full attention to the method of Mr. Alexander instead of its results, does he realize the constant influence of his sensory appreciation. The perversion of our sensory consciousness of ourselves has gone so far that we lack criteria for judging the doctrines and methods that profess to deal with the individual human being. We oscillate between reliance upon plausible general theories and reliance upon testimonies to specific benefits obtained. We oscillate between extreme credulity and complete skepticism. On the one hand, there is the readiest acceptance of all claims made in behalf of panaceas when these are accompanied by testimonies of personal benefits and cures. On the other hand, the public has seen so many of these panaceas come and go that it has, quite properly, become skeptical about the reality of any new and different principle for developing human well-being. The world is flooded at present with various systems for relieving the ills the human flesh is heir to, such as systems of exercise for rectifying posture, methods of mental, psychological, and spiritual healing, so that, except when there happens to be an emotional wave sweeping the country, the very suggestion that there is fundamental truth in an unfamiliar principle is likely to call out the feeling that one more person, reasonably sensible about most things, has fallen for another one of the "cure-alls" that abound. "How," it will be asked, "can the teaching of Mr. Alexander be differentiated from these other systems? What assurance is there that it is anything more than one of them, working better perhaps for some persons and worse for others?' If, in reply, specific beneficial results of Mr. Alexander's teaching are pointed out, one is reminded of the fact that imposing testimonials of this kind can be produced in favor of all the other systems. The point, then, to be decided is: What is the worth of these results and how is their worth to be judged? Or, again, if it is a question of the theories behind the results, most of the systems are elaborately reasoned out and claim scientific or spiritual backing. In what fundamental respect, then, do the principles and consequences of Mr. Alexander's teaching differ from these? These are fair questions, and it seems to me that probably the best thing that this introduction can do is to suggest some simple criteria by which any plan can be judged. Certain other questions may suggest the path by which these criteria may be found. Is a system primarily remedial, curative, aiming at relief of sufferings that already exist; or is it fundamentally preventive in nature? And if preventive rather than merely corrective, is it specific or general in scope? Does it deal with the "mind" and the "body" as things separated from each other, or does it deal with the unity of man's individuality? Does it deal with some portion or aspect of "mind" and "body" or with the re-education of the whole being? Does it aim at securing results directly, by treatment of symptoms, or does it deal with the causes of malconditions present in such a way that any beneficial results secured come as a natural consequence, almost, it might be said, as by-products of a fundamental change in such conditioning causes? Is the scheme educational or non-educational in character? If the principle underlying it claims to be preventive and constructive, does it operate from without by setting up some automatic safety-device, or does it operate from within? Is is cheap and easy, or does it make demands on the intellectual and moral energies of the individuals concerned? Unless it does the latter, what is it, after all, but a scheme depending ultimately upon some trick or magic, which, in curing one trouble, is sure to leave behind it other troubles (including fixations, inhibitions, laxities, lessening of power of steady and intelligent control), since it does not deal with causes, but only directs their operation into different channels, and changes symptoms from such as are perceptible into more subtle ones that are not perceived? Anyone who bears such questions as the above in mind whilst reading Mr. Alexander's book will have little difficulty in discriminating between the principles underlying his educational method and those of the systems with which it might be compared and confused. Any sound plan must prove its soundness in reference both to concrete consequences and to general principles. What we too often forget is that these principles and facts must not be judged separately, but in connection with each other. Further, whilst any theory or principle must ultimately be judged by its consequences in operation, whilst it must be verified experimentally by observation of how it works, yet in order to justify a claim to be scientific, it must provide a method for making evident and observable what the consequences are; and this method must be such as to afford guarantee that the observed consequences actually flow from the principle. And I unhesitatingly assert that, when judged by this standard—that is, of a principle at work in effecting definite and verifiable consequences—Mr. Alexander's teaching is scientific in the strictest sense of the word. It meets both of these requirements. In other words, the plan of Mr. Alexander satisfies the most exacting demands of scientific method. The principle or theory of Mr. Alexander and the observed consequences of its operation have developed at the same time and in the closest connection with each other. Both have evolved out of an experiemental method of procedure. At no time has he elaborated a theory for its own sake. This fact has occasionally been a disappointment to "intellectual persons" who have subconsciously got into the habit of depending upon a certain paraphernalia of technical terminology. But the theory has never been carried beyond the needs of the procedure employed, not beyond experimentally verified results. Employing a remarkably sensitive power of observation, he has noted the actual changes brought about in individuals in response to the means which he has employed, and has followed up these changes in their connections with the individual's habitual reflexes, noting the reactions due to the calling into play of established bad habits, with even greater care than the more obvious beneficial consequences obtained. Every such undesirable response has been treated as setting a problem—namely, that of discovering some method by which the evocation of these instinctive reactions, and the feelings associated with them, can be inhibited, and in their stead, such acts called into play as will give a basis for correct sensory appreciations. Every step in the process has been analyzed and formulated, and every changing condition and consequence, positive or negative, favorable or unfavorable, which is employed as a means for developing the experimental procedure, has been still further developed. The use of this developed method had, of course, continuously afforded new material for observation and thorough analysis. To this process of simultaneous developement of principles and consequences, used as means for testing each other, there is literally no end. As long as Mr. Alexander uses the method, it will be a process tending continually towards perfection. It will no more arrive at a stage of finished perfection than does any genuine experimental scientific procedure, with its theory and supporting facts. The most striking fact of Mr. Alexander's teaching is the sincerity and reserve with which he has never carried his formulation beyond the point of demonstrated facts. It is obvious, accordingly, that the results obtained by Mr. Alexander's teaching stand on a totally different plane from those obtained under the various systems which have had great vogue until they have been displaced by some other tide of fashion and publicity. Most of those who urge the claims of these systems point to "cures" and other specific phenomena as evidence that they are built upon correct principles. Even for patent medicines an abundance of testimonials can be adduced. But the theories and concrete facts in these cases have no genuine connection with each other. Certain consequences, the "good" ones, are selected and held up for notice, whilst no attempt is made to find out what other consequences are taking place. The "good" ones are swallowed whole. There is no method by which it can be shown what consequences, if any result from the principle invoked, or whether they are due to quite other causes. But the essence of scientific method does not consist in taking consequences in gross; it consists precisely in the means by which consequences are followed up in detail. It consists in the processes by which the causes that are used to explain the consequences, or effects, can be concretely followed up to show that they actually produce these consequences and no others. If, for instance, a chemist pointed, on the one hand, to a lot of concrete phenomena which had occurred after he had tried an experiment and, on the other hand, to a lot of general principle and theories elaborately reasoned out, and then proceeded to assert that the two things were connected so that the theoretical principles accounted for the phenomena, he would meet only ridicule. It would be clear that he was offering nothing but assertion. Mr. Alexander has persistently discouraged the appeal to "cures" or to any other form of remarkable phenomena. He has even discouraged keeping records of these cases. Yet, if he had not been so wholeheartedly devoted to working out a demonstration of principle—a demonstration in the scientific sense of the word—he would readily have had has day of vogue as one among the miracle-mongers. He has also persistently held aloof from building up an imposing show of technical terminnology of physiology, anatomy, and psychology. Yet that course also would have been easy in itself, and a sure method of attracting a following. As a consequence of this sincerity and thoroughness, maintained in spite of great odds, without diversion to side-issues of fame and external success, Mr. Alexander has demonstrated a new scientific principle with respect to the control of human behavior, as important as any principle which has ever been discovered in the domian of external nature. Not only this, but his discovery is necessary to complete the discoveries that have been made about non-human nature, if these discoveries and inventions are not to end by making us servants and helpless tools. A scientific man is quite aware that no matter how extensive and thorough is his theoretical reasoning, and how definitely it points to a particular conclusion of fact, he is not entitled to assert the conclusion as a fact until he has actually observed the fact, until his senses have been brought into play. With respect to distinctively human conduct, no one, before Mr. Alexander, has even considered just what kind of sensory observation is needed in order to test and work out theoretical principles. Much less have thinkers in this field ever evolved a technique for bringing the requisite sensory material under definite and usable control. Appeal to suggestion, to the unconscious and to the subconscious, is in its very description an avoidance of this scientific task; the systems of purely physical exercise have equally neglected any consideration of the methods by which their faults are to be observed and analyzed. Whenever the need has been dimly felt for some concrete check and realization of the meaning of our thoughts and judgments about ourselves and our conduct, we have fallen back, as Mr. Alexander has so clearly pointed out in his writings, on our pre-existing sense of what is "right." But this signifies in the concrete only what we feel to be familiar. And in so far as we have bad habits needing re-education, that which is familiar in our sense of ourselves and of our acts can only be a reflection of the bad psycho-physical habits that are operating within us. This, of course, is precisely as if a scientific man, who, by a process of reasoning, had been led to a belief in what we call the Copernican theory, were then to try to test this reasoning by appealing to precisely those observations, without any addition or alteration, which had led men to the Ptolemaic theory. Scientific advance manifestly depends upon the discovery of certain conditions for making new observations, and upon the re-making of old observations under different conditions; in other words, upon methods of discovering why, as in the case of the scientific man, we have had and relied upon observations that have led into error. After studying over a period of years Mr. Alexander's method in actual operation, I would stake myself upon the fact that he has applied to our ideas and beliefs about ourselves and about our acts exactly the same method of experimentation and of production of new sensory observations, as tests and means of developing thought, that have been the source of all progress in the physical sciences; and if, in any other plan, any such use has been made of the sensory appreciation of our attitudes and acts, if in it there has been developed a technique for creating new sensory observations of ourselves, and if complete reliance has been placed upon these findings, I have never heard of it. In some plans there has been a direct appeal to "consciousness" (which merely registers bad conditions); in some, this consciousness has been neglected entirely and dependence placed instead upon bodily exercises, rectifications of posture, etc. But Mr. Alexander has found a method for detecting precisely the correlations between these two members, physical-mental, of the same whole, and for creating a new sensory consciousness of new attitudes and habits. It is a discovery which makes whole all scientific discoveries, and renders them available, not for our undoing, but for human use in promoting our constructive growth and happiness. No one would deny that we ourselves enter as an agency into whatever is attempted and done by us. That is a truism. But the hardest thing to attend to is that which is closest to ourselves, that which is most constant and familiar. And this closest "something" is, precisely, ourselves, our own habits and ways of doing things as agencies in conditioning what is tried or done by us. Through modern science we have mastered to a wonderful extent the use of things as tools for accomplishing results upon and through other things. The result is all but a universal state of confusion, discontent, and strife. The one factor which is the primary tool in the use of all these other tools—namely, ourselves—in other words, our own psycho-physical disposition, as the basic condition of our employment of all agencies and energies, has not even been studied as the central instrumentality. Is it not highly probable that this failure gives the explanation of why it is that in mastering physical forces we have ourselves been so largely mastered by them, until we find ourselves incompetent to direct the history and destiny of man? Never before, I think, has there been such an acute consciousness of the failure of all external remedies as exists today, of the failure of all remedies and forces external to the individual man. It is, however, one thing to teach the need of a return to the individual man as the ultimate agency in whatever mankind and society collectively can accomplish, to point out the necessity of straightening out this ultimate condition of whatever humanity in mass can attain. It is another thing to discover the concrete procedure by which this greatest of all tasks can be executed. And this indispensable thing is exactly what Mr. Alexander has accomplished. The discovery could not have been made and the method of procedure perfected except by dealing with adults who were badly coordinated. But the method is not one of remedy; it is one of constructive education. Its proper field of application is with the young, with the growing generation, in order that they may come to possess as early as possible in life a correct standard of sensory appreciation and self-judgment. When once a reasonably adequate part of a new generation has become properly coordinated, we shall have assurance for the first time that men and women in the future will be able to stand on their own feet, equipped with satisfactory psycho-physical equilibrium, to meet with readiness, confidence, and happiness instead of with fear, confusion, and discontent, the buffetings and contingencies of their surroundings. Reprinted by arrangement with Dutton Signet, a division of of Penguin Books U.S.A.
Reprinted with permission of Victor Gollancz Limited, London, publishers of Constructive Conscious Control of the Individual, 1987 edition. Copyright the Estate of F. M. Alexander 1987. Alexander Technique Center of Washington, D.C.